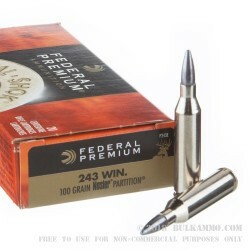 This 243 Win cartridge from Federal’s Vital-Shok line of ammunition sports a 100 grain soft point Nosler Partition projectile. 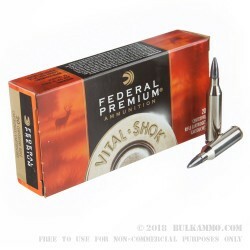 The bullet features a special lead alloy dual-core for superior mushrooming at practically any velocity. 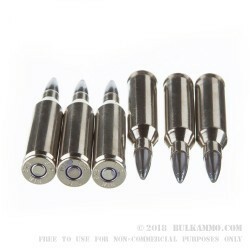 Its fully tapered copper alloy jacket is designed to rupture at the mouth instantly upon impact, but gradually thickens toward the bullet’s middle to control expansion. The integral partition in this bullet retains the lead alloy in the rear core, granting the bullet good momentum for deep penetration. Finally, the special crimp locks in this bullet’s base help it to resist deformation while firing. 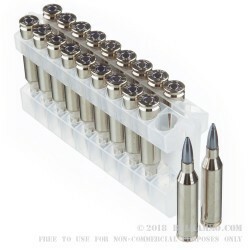 With its non-corrosive Boxer primed brass casing, this cartridge can serve you well during a great many hunting trips. It’s another great example of the peerless value that Federal has offered to virtually every kind of shooter since their foundation in 1922.